Board Booster Closed – Now What? This post may contain affiliate links. When you click these links and make a purchase, I may get a small kickback from the seller, at no extra cost to you. Pretty cool, right? Learn more about affiliate marketing here. What is the Pinterest “Following Feed”? Pinterest has been hinting at releasing a “following” tab ever since we’ve all been complaining about not being able to see pins in real-time from the people we follow on Pinterest. Today the button went live for everyone! With the NEW “followers button”, you can now see all the content from the accounts you follow in real-time chronological order. It’s like going back to the Pinterest of 2014! Click on the icon showing two people, to the right of the search bar. Don’t have the Following Feed button on your account yet? But … is this bad news for businesses? Why does the Pinterest Following Feed matter to businesses and bloggers? For the last couple years, followers weren’t a huge focus on Pinterest. That’s because with Pinterest SmartFeed, users were served up content based on what they’ve been pinning, what they’re searching, who they follow, and lots of other factors. We were more focused on getting individual pins discovered than by attracting users to follow our accounts. With the SmartFeed, content is served up to your followers first. Then, based on the pin’s performance with a small sampling of your followers, Pinterest determines who (if anyone) else to serve the content to in the SmartFeed. I verified this during a recent talk given by Pinterest rep Enid Hwang at a conference I attended. 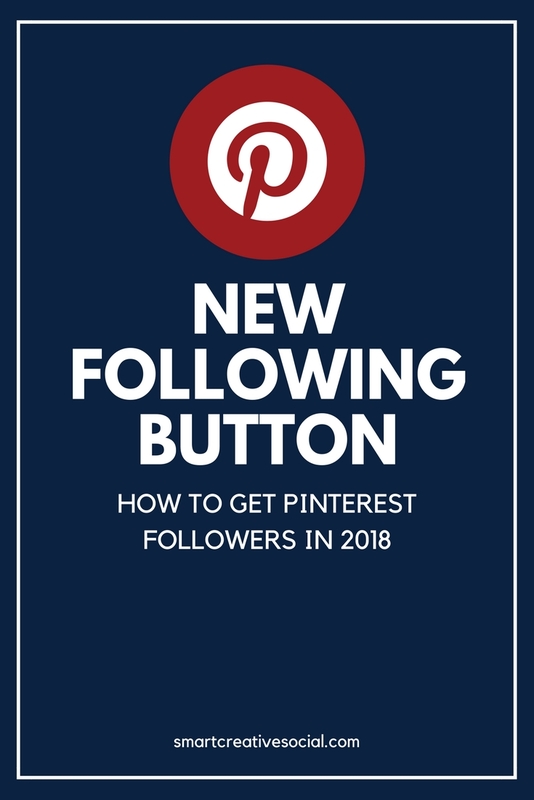 With the new followers button, growing your followers count on Pinterest is more important than ever, especially once people discover they can use this button to ONLY see posts from people they follow. So what can we do now? The good news is that it looks like the Following button and the SmartFeed with both co-exist. The SmartFeed will still shows as the default home page of Pinterest when you first login. To access the Following feed, users need to click the Followers button. We’ll still be able to use all of the strategies we are currently using to get our content to show up in the SmartFeed. The Following button shows content from everyone a person follows. 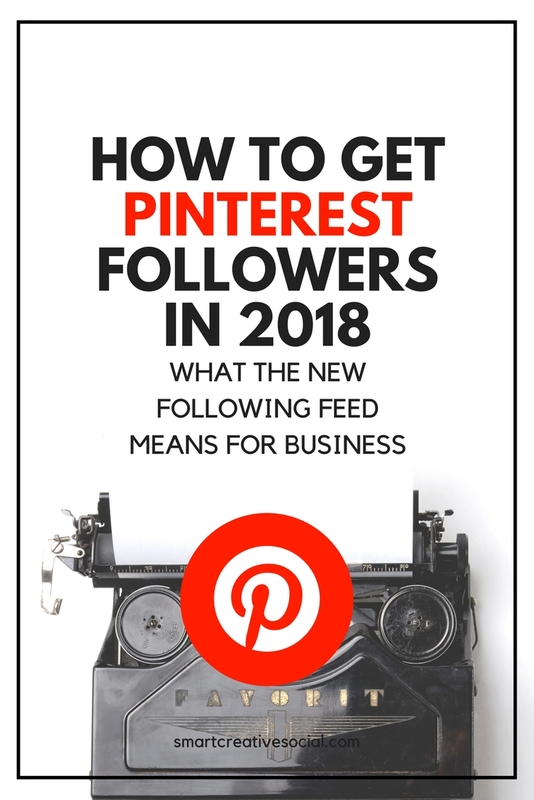 If you have not been focuses on growing your followers on Pinterest (*raises hand*) then now’s the time to get started. Group boards are a popular way to increase your follower count and expose your content to new people. However, I dislike group boards as significant part of a strategy because you don’t control them. At any moment, the group board owner can remove your access, delete your pins, or even delete the board, even if you have been following all of their rules. You’re also dependent on the group board owner enforcing their guidelines and making sure that good quality content is pinned to the board to help it grow. If you are going to use group boards as a way to grow your followers, just be aware that you need to check the board often to make sure that it is performing well and that other members are pinning quality content, and you also have to be aware that your access to the board can be revoked at any time, for any reason. Be a helpful leader by sharing the news about the following button with your followers. And in that context, encourage your followers to follow you on Pinterest! I made a video showing my followers how to access the new Following feed on Pinterest. Then I told them to follow my account on Pinterest! People love to have the inside scoop and if you put into context with the type of content they expect from you, it makes sense. For example, for Smart Fun DIY I told viewers that I wanted to help them find the best DIY projects from their favorite bloggers, on Pinterest. You can make a helpful video like this on your own or you can share mine and change the call to action to get people to follow your account. Share the news with your followers in your newsletter, on other social media platforms like twitter and YouTube, and embed boards in your blog posts. Make sure to include a call to action to let people know how to follow you along with a link. (Scroll to the end of the post to see how to do it). Now that we know that users can access a feed of all the pins from their followers, in real-time chronological order, it’s super important that we pin all throughout the day and night. Our followers are accessing their feeds all throughout the day and night and with time zones, it’s even more important that we are pinning across all hours of the day so that our content has a chance to show up at the top of the Following Feed. If you are manually pinning, this kind of volume and frequency of pins is going to be almost impossible to keep up. That’s why I recommend using a pin scheduling tool from a Pinterest-approved partner like Tailwind. Tailwind allows you to schedule your pins show they show up on different boards at different times of day. I use Tailwind to “pin stack”, a technique where you can schedule a single pin to pin to multiple boards over a period of time. Using this strategy, I can schedule 5 pins a day for 30 days in about an hour. Imagine how much faster your pinning will be with Tailwind! Watch this video to see how easy it is to schedule your pins all throughout the day and night with tailwind … this is gonna be your secret weapon for making sure your pins are always at the top of the Following Feed! Use the Following button to find and repin NEW content! Hey, why can’t we use the Following Feed too? You’re probably following your fellow bloggers and business owners on Pinterest. Use the Followin Feed to find their most recent content and repin it. 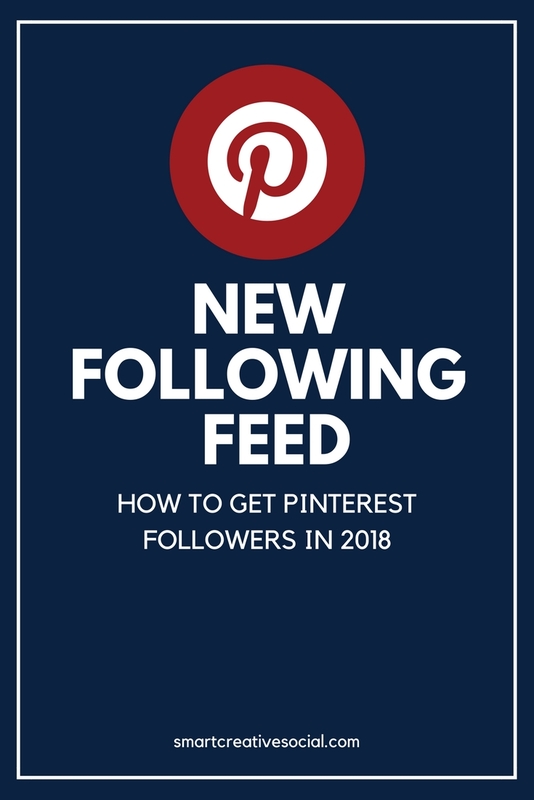 This is a great way to give their pins a boost, share content from others that your followers will like, and be a good community member on Pinterest. The Following Feed makes it easy to find the freshest, newest pins to repin to your account! While you’re looking for fresh new pins in the Following Feed, scope any repeat themes or common elements among the new pins of the accounts you’re following. This is a great way to try to identify trending topics. Then you can create new content along these trends or use Pinterest’s search function to discover pins for the trend to repin. As time goes on, I’m sure we’ll discover more ways to grow our followers and use the Following Feed to our advantage as business owners! 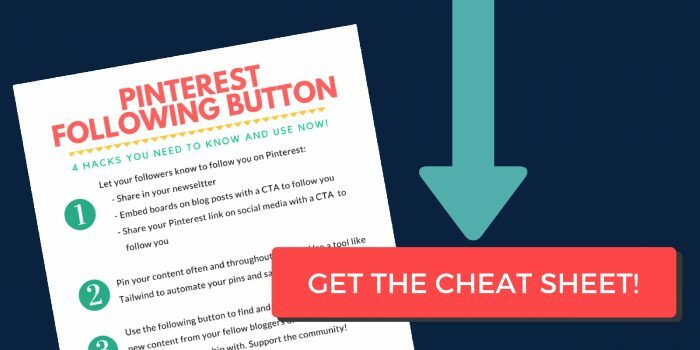 To help with that, I made a handy checklist to help you implement these tactics on your Pinterest account. And hey, are you following me on Pinterest yet? I started a new account just for Smart Creative Social and will be adding more pins very soon. If you’re interested in marketing on Pinterest or learning more about social media strrategy and making money online, FOLLOW ME HERE on Pinterest! A craft industry professional for over 14 years, Jennifer Priest has been featured in major publications and online by the likes of Apartment Therapy and MSNBC. Jennifer's digital marketing consulting firm, Smart Creative Social, has a prestigious client list in the craft and hobby industry, connecting influencers with brands, developing digital marketing strategy, and guiding clients in creating a solid social media strategy for their brand. Tailwind Tribes are now PUBLIC! What is “NoFollow” and When Do I Need It? Hashtags on Pinterest – Hacks you need to try! SMART CREATIVE SOCIAL is a participant in the Amazon Services LLC Associates Program, an affiliate advertising program designed to provide a means for sites to earn advertising fees by advertising and linking to amazon.com. SMART CREATIVE SOCIAL is also a participant in affiliate programs for networks including but not limited to Share-A-Sale, CJ, and Rakuten LinkShare.